Chiang Mai, Thailand. A city where the sun rises above the intersection of the Old City meeting the new and sets behind the mountains of the Thai highlands. Many say Chiang Mai is their favorite place in Thailand and given its setting near the mountains, we were hoping it would be ours too. The city is a major stop on the Thailand tourist trail and it was apparent the moment our plane landed and we were among a number of American tourists at the airport's baggage claim. Up until that moment, we hadn't met, or seen, any other Americans in Thailand. I guess traveling to places like Khao Sok National Park and Baan Nam Kem had kept us rather insulated from the typical American tourist attractions. My vision of our time in Chiang Mai included us strapping on our hiking shoes, finding the nearest mountain in town and hoofing it up to the top on our own. What we discovered when we arrived was a town driven by packaged tours requiring 1,800 baht or more a person to drive you to the mountains for various trekking opportunities. Coming from California where the hiking is endless and mostly free, it seemed unnatural to pay someone to take us on a hike. The Old City of Chiang Mai is square, flanked on all sides by a series of brick gates. The gates lie inside a moat that encapsulates the city's streets and activities. Just outside the gates in all directions, the city of Chiang Mai sprawls into neighborhoods and more streets lined with restaurants, stores and places to stay. Our guesthouse, Top Garden Boutique Guesthouse, was two busy one-way streets and a moat away from the Old City. Any walk through the Old City takes you by numerous Wats (temples) along with block after block of guesthouses, tour agencies and restaurants. We passed the same street corner at least five times our first day. We always knew we had made a circle again when we were in view of Wat Chedi Luang - a spectacular, old pagoda in the center of the city. It was "Hey kids, Big Ben! Parliament!" all day long. Maybe this is why no one really walks around in SE Asia. However, we've learned enough by traveling that the real things to see often lie outside places with gates so we eventually took to the streets outside the Old City. Since we are traveling for a year or more, we are making a conscious effort to not buy much along the way. It's not hard to keep that promise when staying in tourist areas. A little bit harder when you come across something more authentic. 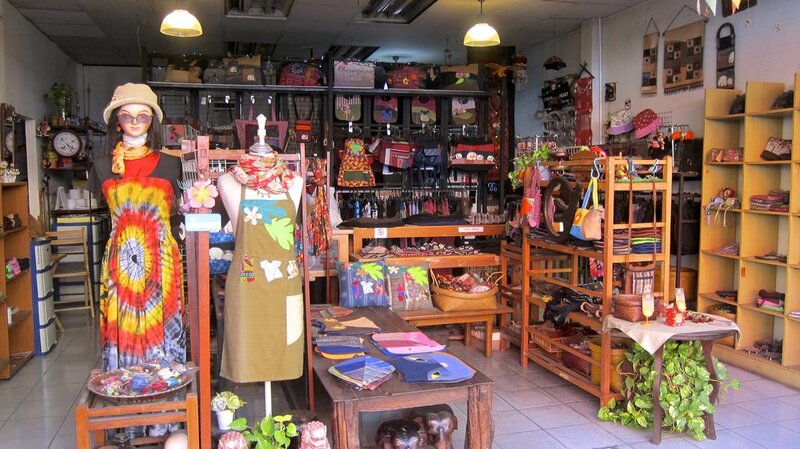 On our second day, we stumbled upon a store called Chiang Mai Heart (on Chang Moi Street), an artisan, handicraft storefront selling bags, wallets and other accessories all designed by the women sitting in the store. Five dollars later, we were the proud owners of two new wallets. Purchasing things at the night markets was a bit easier to avoid. The markets are all over town on any given night and sell everything from chicken satay to handmade soaps to knock-off North Face backpacks. They are a major experience for the senses and definitely worth a visit just for the street food. Outside of the amazing food I made in my cooking class, we dug into bowls of noodles, dishes of curry, plastic cups - and even plastic bags - full of fruit shakes. Khao Soi, a local Burmese influenced dish made with noodles, chicken and a mildly spicy sauce became our order of choice. Hong Taew Inn on Nimmanhaemin Road was a favorite for Khao Soi. Honestly, you can't go wrong. There is food on every corner and every block and it's almost always delicious. Hidden down an alley off Chang Moi, a major street heading east out of the Old City, sat our most peaceful meal location - the W by Wanlamun. Surrounded by plants, bright orange umbrellas and white table cloths, we didn't even need to splurge on the meal to enjoy a little bit of luxury in an otherwise busy city. A peaceful and delicious lunch! More than a few times we relished eating a meal at a road-side stall or restaurant and walking away with only paying $5 or less. Easy there! That's my High Arch! Massages are everywhere and super cheap in Thailand. An hour long Thai massage, foot massage or head/neck/shoulder massage can be had for 180 baht ($6) at almost every establishment. I had read about massage places that help women recently released from prison gain employment. The prison in Chiang Mai runs a program to train inmates who are soon to be released in Thai massage. It helps them gain employment in a relevant skill once they are released. Lila Thai Massage, a shop with five outlets around town, is one such establishment supporting recently released women. I convinced Dave to join me for a foot massage and only told him about the prison affiliation after he told me his foot massage was a little rough! I loved mine and the hour went by way too fast. What a great way to support women who may otherwise have a very hard time re-integrating into society. One luxury we rarely deny ourselves at home is good coffee. Whether in a shop or having beans at home, our second biggest expense next to wine is always coffee. Much to our dismay, the coffee we'd been drinking in Thailand was just okay or was Nescafe - until we got to Chiang Mai. The local vibe in Chiang Mai has encouraged a large number of coffee shops to sprout up and they are on almost every street corner. We traversed the city in search of the best lattes, cappuccinos and iced coffee and boy, was I happy. Just inside the Old City near the Tha Pae gate sits Ponganes Espresso. The small, cozy shop and patio was tucked just enough off the main street to be a calm start to the day. Our perfect latte and cappuccino was a great beginning to our coffee crusade. Akha Ama could be in Portland or San Francisco in a heartbeat (in fact, they had bags of beans from some of our favorite stateside shops). The coffee is strong, the ambiance is incredibly inviting and the baristas behind the bar could be riding one-speeds around the neighborhood. You would never guess it's a social enterprise benefitting a hill-tribe in Northern Thailand. Finding this shop was an adventure as we walked along the north side of the city and down a dead end street, but isn't getting there half the fun? Are we in Portland or Chiang Mai? We were thanking our lucky stars that this coffee shop was near our hotel for our volunteer orientation. In a hip area of town, Rist8to is defining what great coffee should taste like and what beautiful lattes should look like. You chose the type of drink and the beans you want (from any of the major coffee-growing regions) and in a few minutes, a cup full of deliciousness is delivered to your table. As one of the only coffee shops in this part of town that opens early (7:08 am to be exact), it was our go-to for starting our orientation days off right. I'm still dreaming of this coffee! In a bizarre outdoor mall called The Harbour, Blue Cup Coffee's design reminded us so much of Blue Bottle in San Francisco that we had to try it. For a refreshing iced coffee treat on a very hot day, it met our expectations but was nowhere close to meeting our love for Blue Bottle. All in all, I didn't leave Chiang Mai with the bliss others seem to find there. I'm sure we missed some incredible experiences like bathing elephants at the Elephant Nature Park and taking a trip to nearby Pai. We had a good time exploring the city when it was all said and done, but I imagine it's a better place to live and have roots than to just visit. It's a city where you need a group of friends to meet at your favorite bar on a Thursday night or a regular routine you fall into that takes advantage of the cheap living and expat-friendly lifestyle.